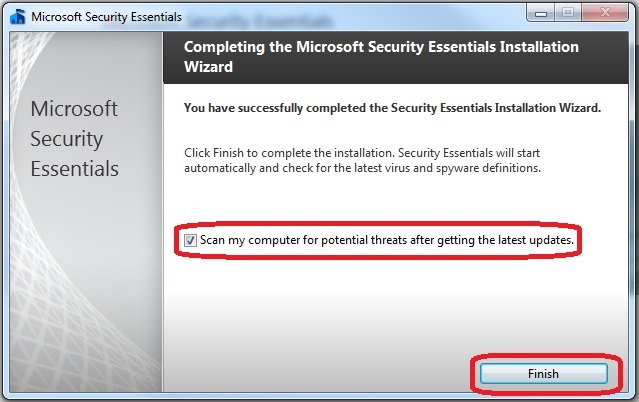 Installing Anti-Virus, Anti-Spyware and Anti-Malware programs. Once downloaded, double click on the mseinstall icon. When you first open the install screen, you may be prompted with a Do you want to run this file window. If so, click on Run. 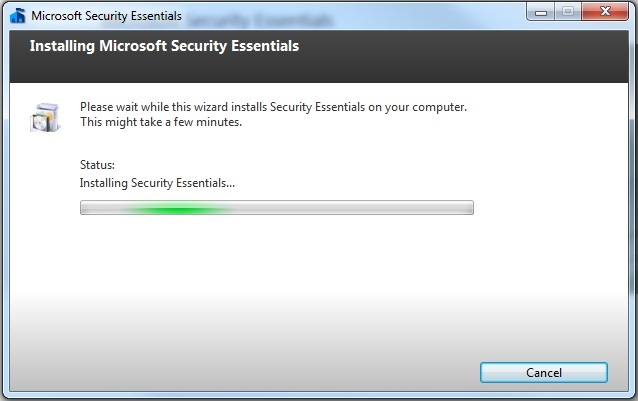 Microsoft Security Essentials will now begin installing. 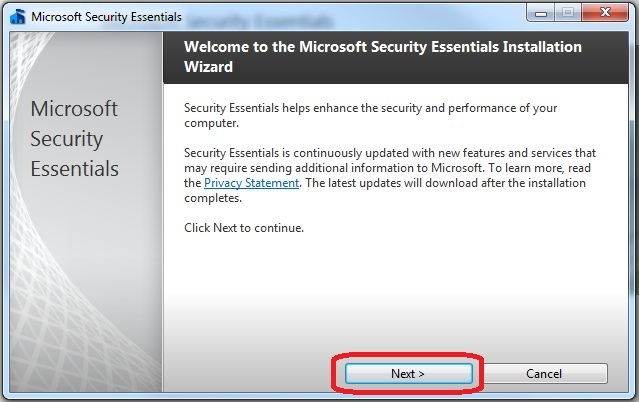 Microsoft Security Essentials is now installed on your computer. 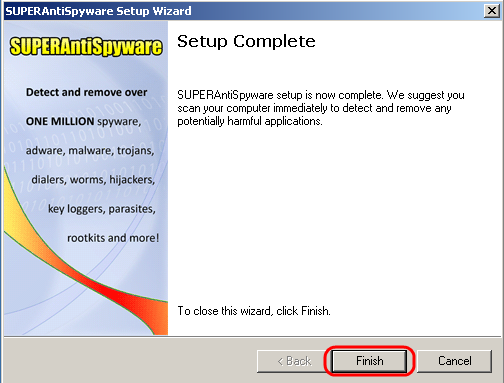 SUPERAntiSpyware detects and removes Spyware, Adware, Malware, Trojans, Dialers, Worms, KeyLoggers, HiJackers, Parasites, Rootkits, and many other types of threats. SUPERAntiSpyware protects from Real-Time Blocking of threats. Its First Chance Prevention examines over 50 critical points of your system each time your system starts up and shuts down to eliminate threats before they have a chance to infect and infiltrate your system. 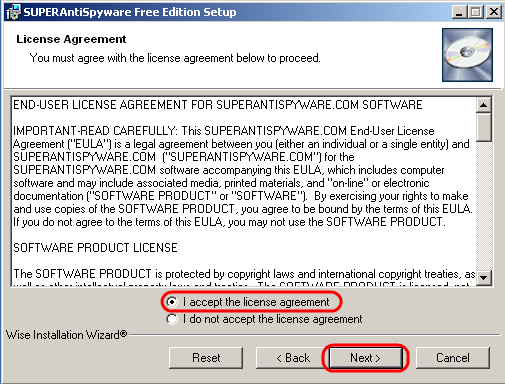 SUPERAntiSpyware will be used to remove spyware, adware and other harmful software off a computer that might harm the operating system. 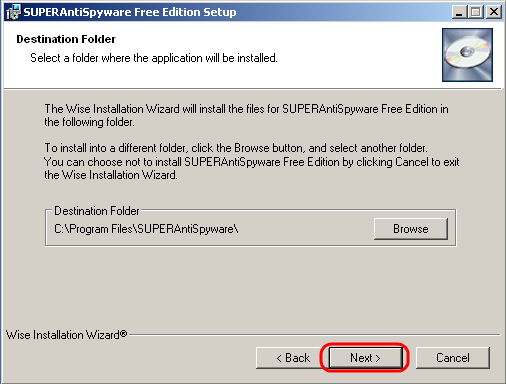 As with any other Anti-Spyware program, SUPERAntiSpyware should be updated before any scans have been ran. 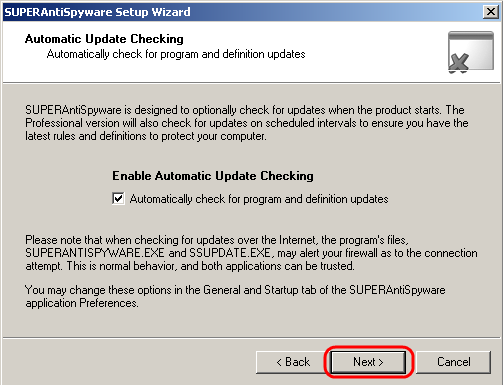 SUPERAntiSpyware will do this update process automatically when the program is started. 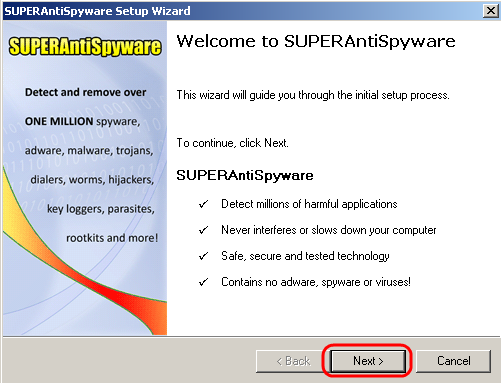 Once downloaded, double click on the SUPERAntiSpyware icon. On the welcome screen, press Next. Select I accept the license agreement and click Next. Enter your name, select Anyone who uses this computer, and click next. Organization is not required. For the destination folder, it's best to leave it default and just press Next. Click Finish once it has successfully installed. 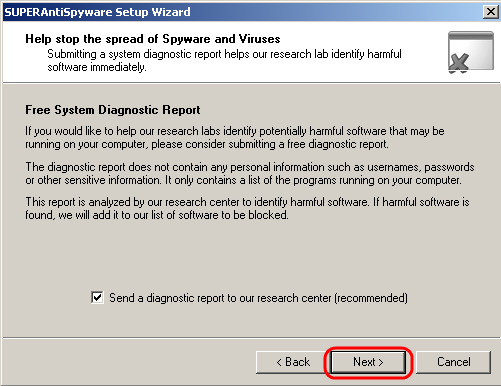 SUPERAntiSpyware should now open a screen to select a language. Choose your language and press OK.
Click Yes when asked if you would like to check for updates now. An initial setup for the software will now open. Click Next to continue. For the E-mail Notification, you can leave this field blank unless you want to receive emails from the SUPERAntiSpyware mailing list. Click Next. Leave the check mark in Enable Automatic Update Checking and press Next. Leave a check mark in Send a diagnostic report to our research center and click Next. Your install is now finished. Press Finish to close out of the setup. Malwarebytes’ Anti-Malware can detect and remove malware that even the most well known anti-virus and anti-malware applications fail to detect. Malwarebytes'' Anti-Malware monitors every process and stops malicious processes before they even start. The Real time Protection Module uses advanced heuristic scanning technology which monitors your system to keep it safe and secure. In addition, we have implemented a threats center which will allow you to keep up to date with the latest malware threats. Malwarebytes’ Anti-Malware will be used to remove spyware, adware and other harmful viruses off a computer that might harm the operating system. As with any other Anti-Spyware programs, Malwarebytes’ Anti-Malware should be updated before any scans have been ran. This update process must be started manually. 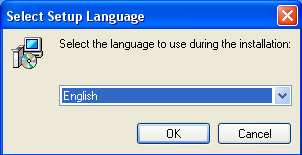 When installing, it will first ask to select a language. Choose your language and press OK.
Now you should see a welcome screen. Click Next. On the information window, press Next. For the destination location, it is best to leave it at it's default and press Next. 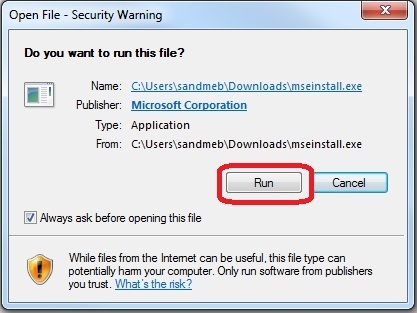 By default, Malwarebytes' wants to create a shortcut to it's program in your start menu. If you do not want to have the short cut, then put a check mark in Don't create a Start Menu folder. Then click Next. Malwarebytes' also gives you options to put shortcuts on your desktop and in the quick launch. You mat select which shortcuts you would like, if any, and press Next. Once you're at the Ready to Install screen, simply press Install. 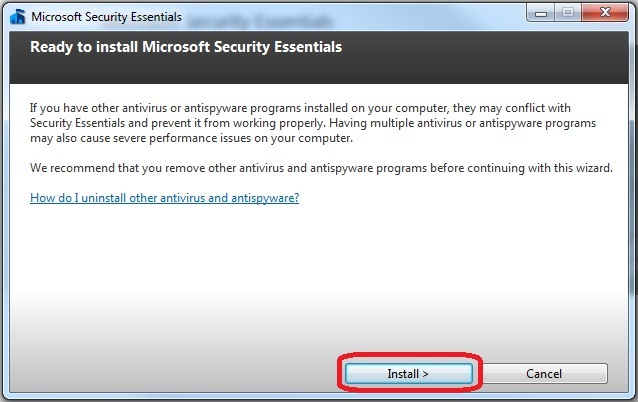 When the installation is complete, Update Malwarebytes' Anti-Malware and Launch Malwarebytes' Anti-Malware will be checked by default. Leave them both checked and press Finish. 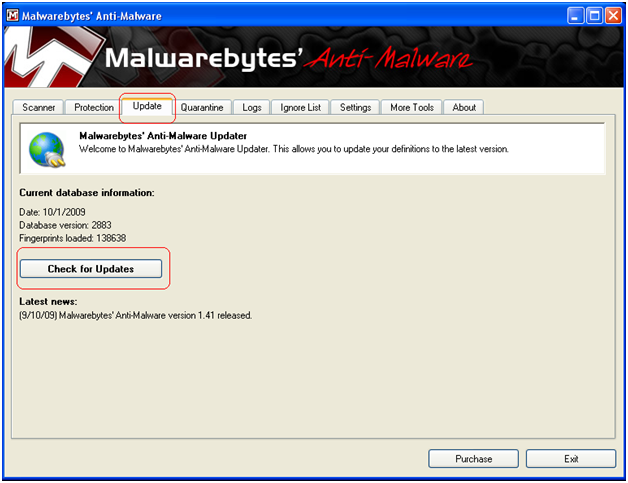 Malwarebytes' Anti-Malware will now perform an update to make sure its virus database is fully up to date. Once the installation is complete, Malwarebytes' Anti-Malware will open and you are now able to begin scans on your computer. 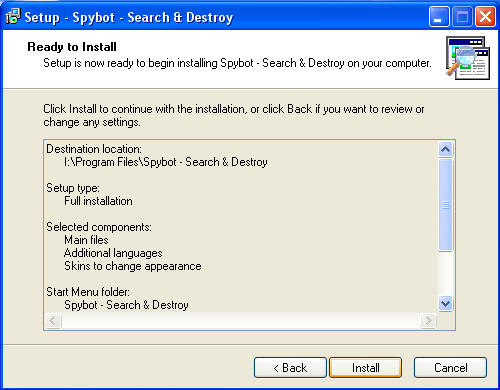 Spybot - Search & Destroy detects and removes spyware, a relatively new kind of threat not yet covered by common anti-virus applications. Spyware silently tracks your surfing behavior to create a marketing profile for you that is transmitted without your knowledge to the compilers and sold to advertising companies. If you see new toolbars in your Internet Explorer that you haven''t intentionally installed, if your browser crashes inexplicably, or if your home page has been "hijacked" (or changed without your knowledge), your computer is most probably infected with spyware. 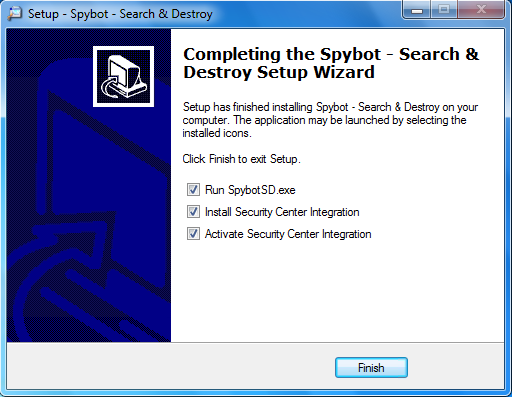 For the Brainy Bunch, we use Spybot - Search & Destroy to remove spyware, adware and other harmful viruses off a computer that might harm the operating system. 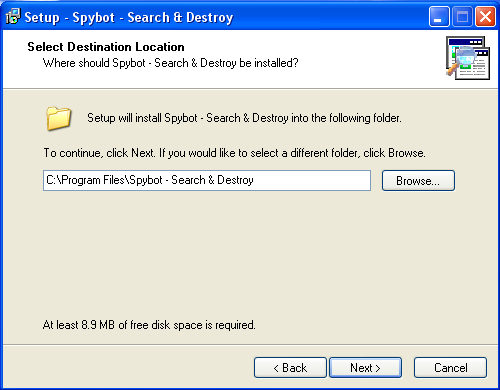 As with any other Anti-Spyware programs, Spybot - Search & Destroy should be updated before any scans have been ran. This update process must be started manually. 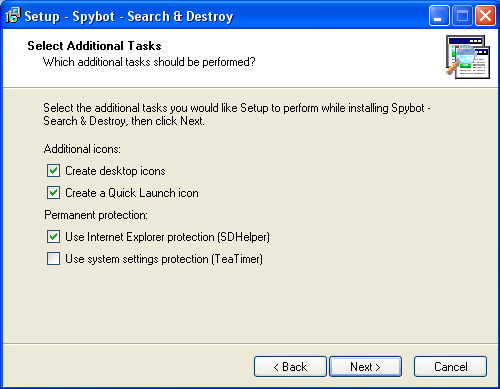 Once downloaded, double click on the SpyBot icon to start the installation process. The installation will start by asking your language. Select your language and press OK.
Next will be a welcome screen. Press Next. Select I accept the agreement and press Next. For the Select Destination Location screen, it is best to leave it default and press Next. 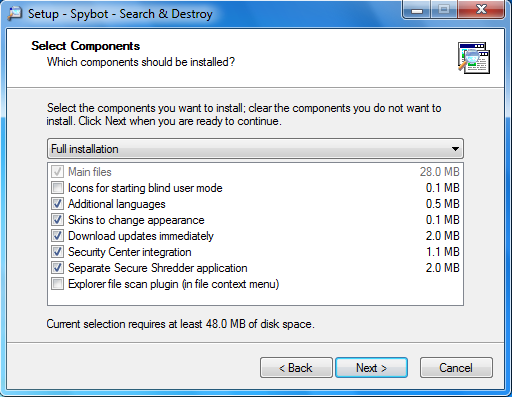 free SpyBot has a special accessibility mode for users who are visually impaired. If you or someone who uses your PC is partially sighted, you may wish to enable this option so that the program can be started in this mode. Installs additional languages along with the language you selected at the start of the installation. This will install additional 'skins' or 'themes' for the program. If you don't like the way it looks, you can change it by using another skin. 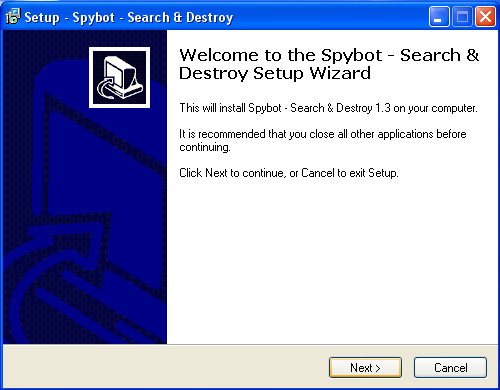 This won't make free SpyBot any better at catching Windows spyware, but it may make it look cooler. 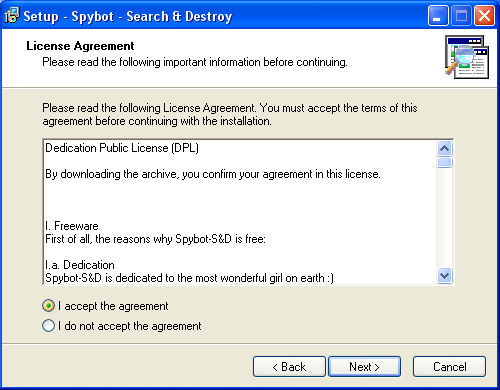 This option makes the SpyBot installer connect to the internet and check for updates. 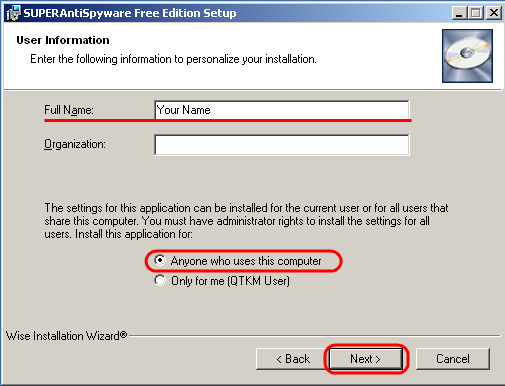 It is important to keep your software up to date so that it knows all about the latest Windows spyware threats. 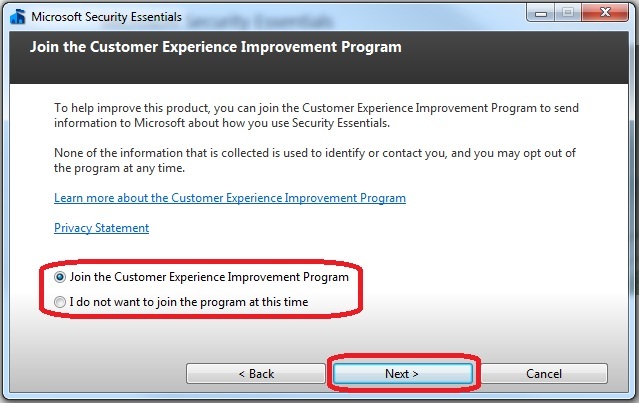 We recommend you select this option but also check for updates manually as soon as the installation is finished. 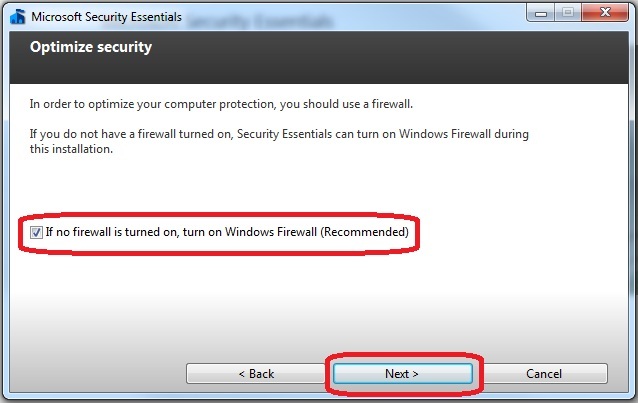 The Windows Security Center monitors antivirus, antispyware and other security software on your PC. 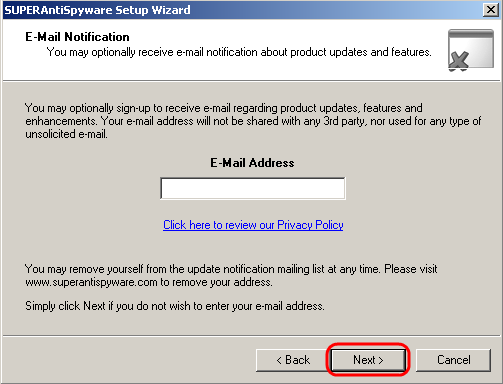 If you choose this option, SpyBot will integrate itself with the Security Center allowing Windows to notify you if there is a problem with the software. This installs a separate file shredder program. We have not tested this program and cannot comment on how well it performs. 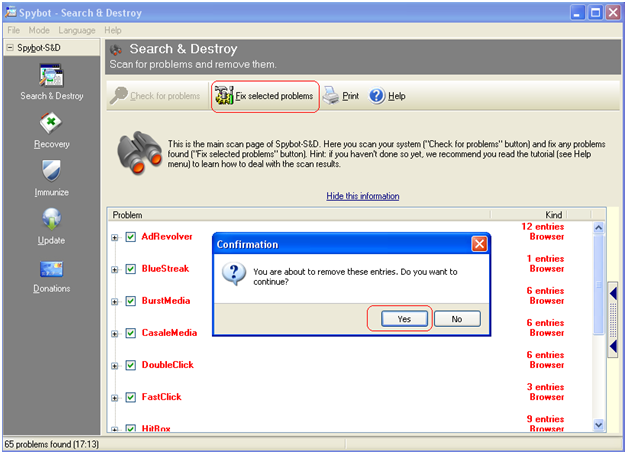 If you choose this option, SpyBot will add a menu option to your right click context menu in Windows Explorer. Now you will be able to navigate to a folder and right click on it and scan it with SpyBot. Once you have selected the components you would like, press Next. 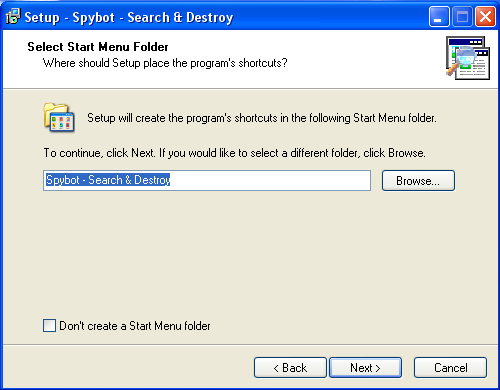 By default, SpyBot installs a folder within your start menu that includes a shortcut to the program. You my leave this as is or check Don't create a Start Menu Folder if you do not wish to have it added to your start menu. Then press Next. Now you will have more options for shortcuts. The default options are fine for most users, but you may change them to your liking. Then click Next. At the Ready to Install screen, press Install. 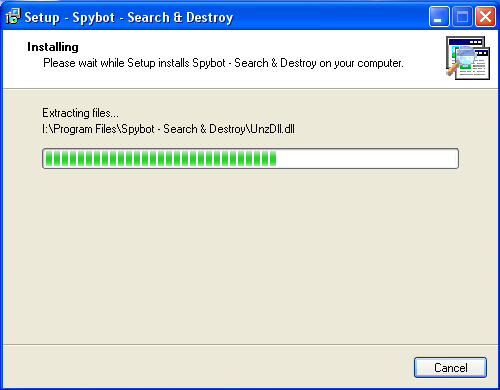 SpyBot will now begin installing. Avira AntiVir Personal Free is a reliable free antivirus solution, which constantly and rapidly scans your computer for malicious programs such as viruses, Trojans, backdoor programs, hoaxes, worms, dialers etc. Monitors every action executed by the user or the operating system and reacts promptly when a malicious program is detected. Antivir will be used to remove virus, malicious programs and software off a computer that might harm the operating system. Once downloaded, double click on the Avira AntiVir icon. On the first screen, press Continue. On the More Threat Categories screen, press Next. 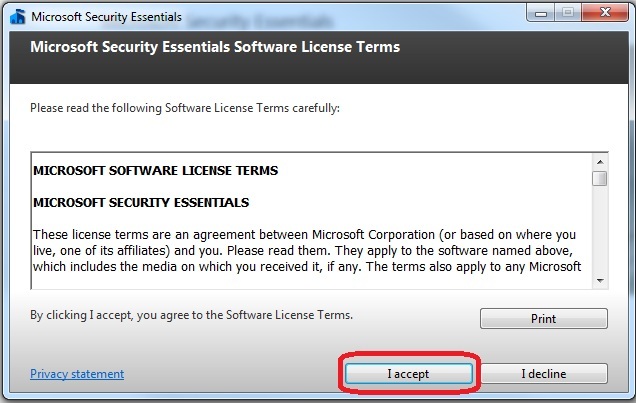 For the License Agreement, put a check next to I accept the terms of the license agreement and click Next. On the Confirmation screen, check the box that says I accept that Avira AntiVir Personal - Free Antivirus is for private use only and must not be used for any kind of commercial or business purpose and press Next. Select Complete for the Installation Type and press Next. Next will be a Registration section. The fields marked with an * are required to be filled out. Fill out all the required fields and press Next. If your registration was successful, you should see a results screen like this one. Press Next to continue. Avira AntiVir will now begin installing. A Configuration Wizard should now open. Press Next. On Configure AHeAD, select Activate AHeAD heuristics and Medium detection level. Then press Next. For the selected extended threat categories, it's best to leave them at their default values or select Select all. In Guard Start mode, select Normal start and press Next. It is recommended to leave Perform short system scan after installation selected and press Next. The installation is now complete. Press Finish. Avira AntiVir will now scan for updates to ensure it's virus database is up to date. Once the update is finished, Avira AntiVir should start up and the installation process is now complete. Posted - Thu, Jul 28, 2011 at 10:17 AM. This article has been viewed 87957 times.